The experts in JuicefulThings, the Panther Group’s think tank, achieve a big effect by optimising small details when developing new meat trays. The design improvement is based on stacking lugs at the narrow ends of the trays, which are used mainly for packing and transporting meat and other tray products or loose goods. 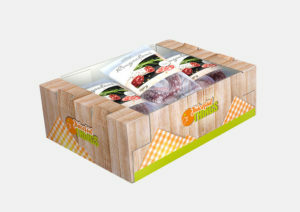 Meat processors use large numbers of corrugated board trays to distribute their merchandise to the retail. The trays start their journey to their destination stacked on pallets, and quite often pass through several stages of the logistics chain on the way. The high level of transport stress on the packages and pallet units en route to the consumer demand great stability, and above all secure stackability. The newly designed lugs fulfil these requirements in an optimum way. Two of the sturdy lugs project at each narrow end of the tray and attach to corresponding points of another tray on top of it. This results in securely stacked trays that no longer slide out of position on the pallet. The projecting lugs provide a firm hold in both a lengthways and a sideways direction, thus producing a compact stack of trays on the pallet. The diecut, pre-scored lugs integrated into the precut blank of the sidewalls are simply bent over at a predefined angle to form the stacking lugs, which lock accurately into corresponding slots cut out in the base of the upper tray. The lugs cause a significantly smaller danger of damage/injury than conventional solutions when the trays are unstacked again. In contrast to normal stacking lugs that are diecut from the flat blank and project vertically upwards, the lugs in the new version are folded sideways and thus cannot bend away unintentionally. Another advantage of the design is that the lugs can also be processed by an automatic machine. The arrangement and shape of the stacking lugs allows a brand-specific print layout on all the sidewalls of the trays at the customer’s request, because the lugs do not affect the image or brand motifs. Four-point security: four stacking lugs shaped on each tray form a securely bonded stack on the pallet and provide non-slip transport to the final destination. Please contact Mrs. Carin Hilmer-Brenzinger, Panther Packaging, Tel. : +49 (0) 4122 501-108 if you have any queries.